When our board meets, we always have a full agenda, responding primarily to issues brought to us by our resort manager. I often feel that we are not making the best use of our time and role as a board. We focus on advising the manager about managing, but I know that the board’s role is to provide thoughtful consideration to the bigger picture and longer-term issues of our resort. Working under the restrictions of a pre-determined agenda, we never seem to get to the big-picture needs of our resort. I would like to see us lay out everything we need to consider and accomplish, and create some priorities so we would have a sense of proportion about how we are spending our time. How do we effectively create priorities within the constraints of the formal board-meeting process? Frankly, doing an effective job of setting priorities for your work as a board in the context of a board meeting is very difficult. When I first became chair of my timeshare board, I knew we desperately needed to prioritize our work. We inherited a situation in which the board chair had acted as chief manager of the resort; the by­laws and rules and regulations were hopelessly out of date; we had no strategic plan; and we were still recovering from a hurricane. We had taken on the responsibility of re­inventing how we were going to run our resort. As an organizational development and board consultant, I had previously conducted hundreds of planning and priority­ setting events with boards, staff, and organizational constituents in relaxed organizational ­retreat settings. When I tried to create a priority setting exercise during a board meeting, I learned how unrealistic it is to do this kind of work within the formal setting of the board meeting and a too ­brief window on the agenda. I began setting aside time on the day before board meetings for board and management retreats, and occasionally owners, so we could do the background spade work necessary for a board to fulfill its role and accomplish its work. In the informal retreat setting, we had the time to sort out and chew on our major issues, and set priorities for our work. For retreats of boards subject to the sunshine laws, everyone involved must understand the rules of the game. When you are in an informal retreat setting, clarify to the participants that you won’t be functioning as a decisionmaking body. You are functioning as a process and policy “recommending” body, just like any committees your board may have. Therefore, you can have non­board members present and participating fully with their ideas and opinions. Often those deeply interested in your resort, although not on the board, can contribute richness to the pool of ideas being considered. If you offer all participants an opportunity to “vote” on priorities, the votes taken in the retreat have no official standing. They are recommendations only, not decisions. At the same time, if a majority of the board is present, you must publicize and post the retreat meeting according to your state’s sunshine laws. If a portion of your retreat is devoted to personnel matters, or your attorney is present on board legal business, you may close that portion by declaring it an “executive session.” To make the work you have done in a retreat worthwhile, you must boil down the results of your work into well-formulated written motions which the board can then consider in a formal board meeting. Formal motions, approved by the board and recorded in the minutes, qualify as directives to management and signal directions for the board and resort. Many helpful techniques exist for setting priorities. I generally used simple methods any board could implement. First, prepare in advance. Invite participants to the retreat. I always included management personnel, and your board may want to include a couple of owners who have shown an interest in board service or the work of the board. 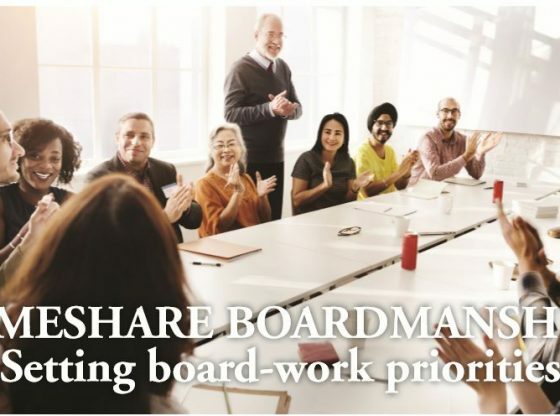 Find an article on the roles and responsibilities of boards to read and send to your participants for inspiration. Create a list of all the work items you believe your board should be tackling. Have available a flip-chart pad, magic markers, masking tape for posting chart sheets on the walls, and several colors of small Post-It notes or “dots” you can purchase at an office-supply store. Prior to brainstorming a comprehensive list, I generally pose the brainstorming question and ask that everyone spend time alone thinking and taking some notes to generate their own ideas before beginning to influence each other. • Conduct a review and update of financial policies. • Research and engage a firm to develop a reserve study. • Develop a five-year strategic plan. • Establish a process and timeline for a management review. • Develop a process for supporting owners through the entire process of purchasing, maintaining, and divesting of unit-weeks or points. After you’ve compiled the comprehensive brainstorming list, invite participants to clarify or ask questions about any of the items. Also invite comments about the meaning, importance, or urgency of the items. Record a summary of each comment on flip charts. Then conduct a vote using the tiny Post-It notes or dots. To identify whether voters were board members, management, or owners, issue different colors of dots to each group. You may want to limit the number of dots they can put on any one item. Depending upon the numbers of people and items involved, you could issue three to six dots for each participant to use, indicating at least three priority items (with no more than two dots on any one item). Alternatively, you could issue six dots to each person, suggesting that they use three on their top priority, two on their second priority, and one on their third priority. Either way, your result should be a prioritized list of items to tackle over several years of board work. Then take three items which could be worked on in the upcoming year, and develop draft work-plan outlines for each of them. • Who is responsible for initiating and leading the work? • What resources are available and/ or needed to accomplish the work? • What tasks need to be done to complete the work? • What is the timeline for accomplishment? Serving on an engaged board that conscientiously oversees management and also performs its own governance responsibilities is hard and uncompensated work! If your board is already accustomed to spending a day in committee meetings and a day in the board meeting, you may hear objections to an additional day in a retreat when the members come in for a regular board meeting. I always maintained the perspective that the cost of paying board members’ expenses for one quarterly face-to-face meeting week on my board was a full year’s maintenance fee paid by an owner for his/her vacation week, multiplied by the number of board members at the meeting. We were making the fullest use of the cost to the owners of the days the board was present at the resort, fulfilling the purpose of serving the members of our owners’ association. Lynne Kweder is an organization development consultant, a board certified coach, trainer of boards of directors and management, and administrator. She spent seven years as board president of the Turtle Reef Condominiums I, Inc., Jensen Beach, FL.